iSamJackson Is The Last iPhone App You'll Ever Need | OhGizmo! You can stop checking the iTunes App Store for new and interesting applications every day because the last program you’ll ever need for your iPhone or iPod Touch has been released. iSamJackson includes over 150 original and authentic quotes recorded by the man himself. 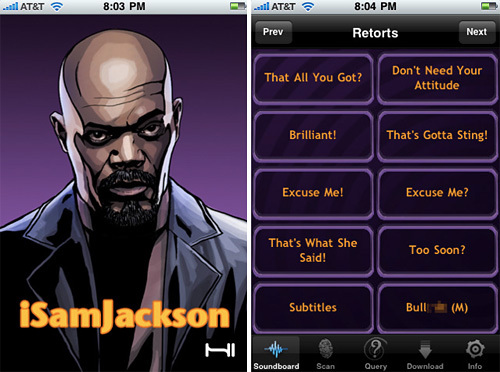 Now yes, it is really nothing more than a Sam Jackson sound board, but these clips aren’t crappy captures taken from his films, but original studio material created just for this app. And you can even customize the sound board so your favorite quotes are all organized onto one page for easy access. $2.99 available from the iTunes App Store in a Clean and +17 Explicit version. Sam Jackson now occupies every 2-3rd movie made in recent history. His voice work populates a lot of animation and video game content. And now he is expanding his presence into the mobile devices media frontier. Judging by this omnipresence in current media, historians will one day think that he was some sort of deity or at least a type of modern day pharaoh. I love his quotes, he's so angry. I really need an iphone…or an itouch. The cost is a bit much for a sound board isn't it.